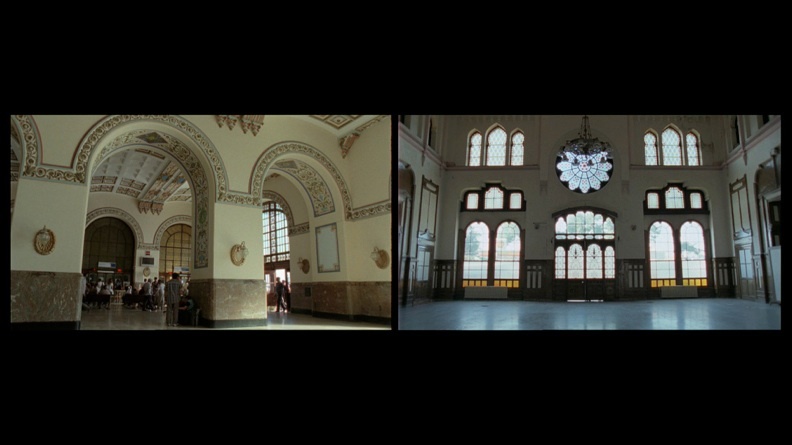 In comparing Istanbul’s two main railway stations, Terminals is made up of two films, each one focusing on one of the stations: Sirkeci, situated on the city’s European side, and Haydarpasa, situated on the Asian side of the Bosphorus. 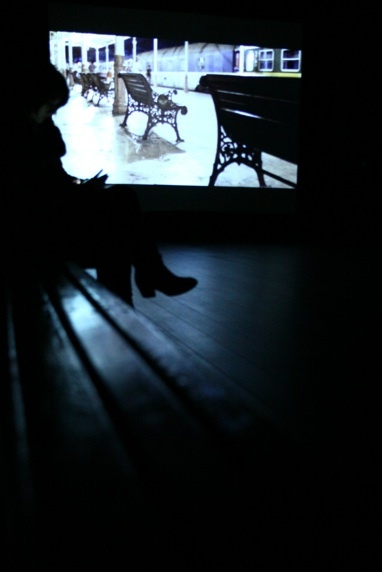 As part of Suspended Spaces#1, Terminals takes on the form of a double projection where two screens are set opposite each other; the installation is presented in a huge room in the Dewailly cloisters. Filling almost all of the two side walls, the two screens face one another just like the two stations which, geographically, stand on either side of the mouth of the Bosphorus. The screens are set more than 50 feet apart. Spectators find themselves in between them, so they are not able to embrace the two images with the same glance. 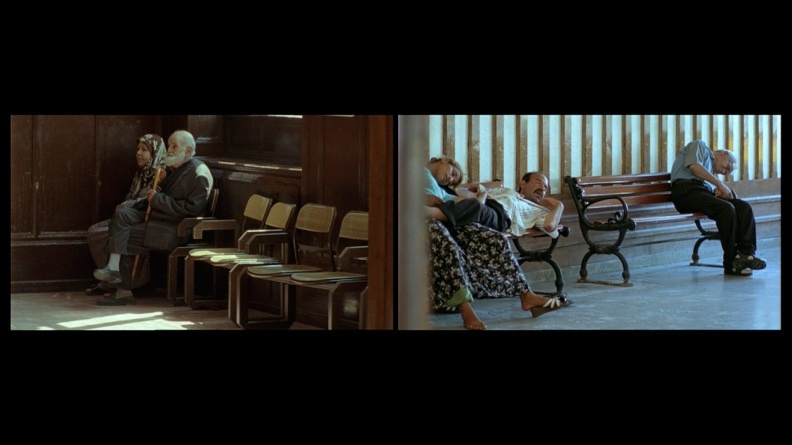 The two films of Terminals stem from one and the same floating aesthetics, informed by many slow tracking shots, long static shots, and one or two slow-motion sequences. 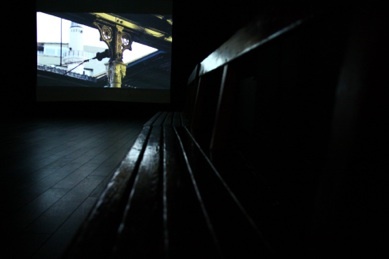 Stefanos Tsivopoulos’s camera thus covers the outside of the stations, as well as their interiors. It lingers on the architecture and the passengers, as well as all those people who spend their days milling around railway stations. The soundtrack is a discreet electronic work which underscores the impression of floating. Stefanos Tsivopoulos’s images call to mind the history that is carried by these two buildings with their quite different styles, symbols of the city’s situation, between East and West. The particular grain of the 16 mm film conjures up some archival document referring to a “golden age” of the city’s modernization. The building of the Sirkeci station, constructed in 1890 by the German architect August Jachmund, is one of the most famous examples of European orientalism. This station opens towards the West, to Budapest and Vienna. It was inaugurated as the Orient Express’s terminus (Paris-Istanbul). Situated on the other side of the Sea of Marmara (on the city’s east bank), the Haydarpasa station was built in 1909 by the German architects Otto Ritter and Helmut Cuno, in the neo-Renaissance European style. It opens to the East and South. During the final years of the Ottoman Empire, this station because the terminus of the Baghdad-Istanbul line, and of the grand railway project linking Istanbul with Medina, by way of Damascus. At the end of the 19th century these railway stations were of great military and commercial importance: they offered the novel possibility of connecting western Europe with the Persian Gulf, skirting around the Suez Canal. As if to illustrate the continuity of this openness to the world, Terminals ends with a succession of close-up portraits--travellers whose eastern and western origins are not that simple to identify, even if the faces in the station on the west bank seem above all to be those of European tourists arriving in the Turkish capital. 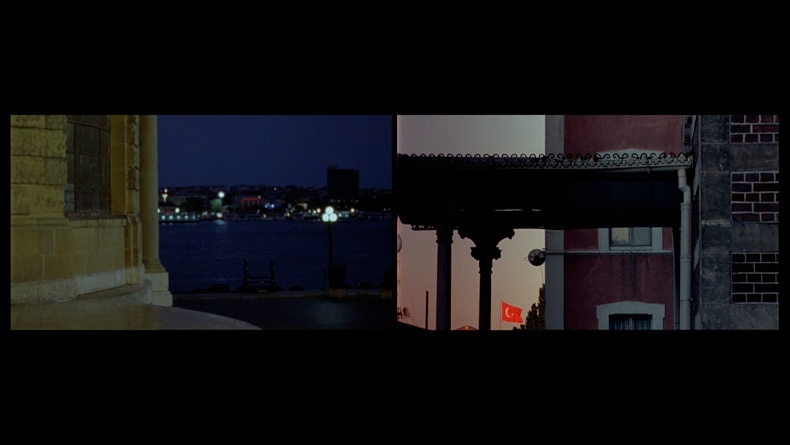 The juxtaposition of the faces, on the two screens, gives, in the negative, so to speak, a cosmopolitan portrait of the city of Istanbul. By thus documenting these two railway stations, Stefanos Tsivopoulos echoes Istanbul’s strategic situation. He questions the link joining a culture to its history, and the processes involved in constructing the memory and identity of people and peoples, based on the organization of representations, and the structuring of space.